Last weekend, I was very close to the goal I set when I returned from Oregon. I saw two does, one on Saturday, one on Sunday. In each case, I could have had a full freezer if it wasn’t regular season. This weekend, however, is the grand finale of late season. Allowed implements are Muzzleloader, Crossbow, and Bow. As usual, I’ll be bringing my Z7. In all my hunting to date, each weekend I’ve hunted a different spot. This has had the advantage of seeing many types of terrain, but the disadvantage of not developing a strong understanding of any piece one of land. Also, with the exception of my friend’s homestead in the Catskills, I’ve been relying on other people to decide the venue and tactics of the hunt. This weekend will be different. Tomorrow, I’m headed back to my friend’s land in Dutchess, alone. I will be hunting from a stand, with a bow, and I’m excited about my prospects. Sunday, I’ll be returning to the Catskills, to hunt the same spot I hunted last weekend. There will be changes, however. Last weekend, I was hunting with a VERY experienced local who knew the ins and outs of the land we were hunting. Due to my other friend having a mishap crossing a stream, and my own stupid choice of footwear (repeat after me: Merrills ARE NOT BOOTS), we wasted most of the morning and only got a few hours of good hunting in. Even in that compressed period, I still jumped a few does (sadly no bucks). Had I not lost my camera the day before, I would have shot this telephone pole that had been chewed up by an 800 pound black bear. The major difference being…the highest markings on this pole were over nine feet off the ground. He is the monster we are hunting on Sunday, with bows. The past two months have taught me a lot: about thermal management, about wind, about silence, about proper footware, navigation, and communication. The room for error this weekend will be minimal. The reason bucks die of old age and black bears grow to almost half a ton on this hill is that few humans ever go out this far. Just getting there requires fording a fast-moving, ice cold stream. If you slip, bang your head on a rock, it’s lights out. The mountain itself is an steep grade with no maintained trails or switchbacks to take the strain off your knees and quads. The peak is about 2600′ higher than the stream crossing we’ll be starting from. The most active bear paths and dens are about half way up. Cellphones don’t work, period. Losing your footing can mean a few hundred feet of rolling and sliding, with falls arrested only by rocks and broken trees. This weekend, I’ll definitely be bringing an overnight “just in case” kit in my pack. I’ll be heading up with my two compatriots from Sterling. 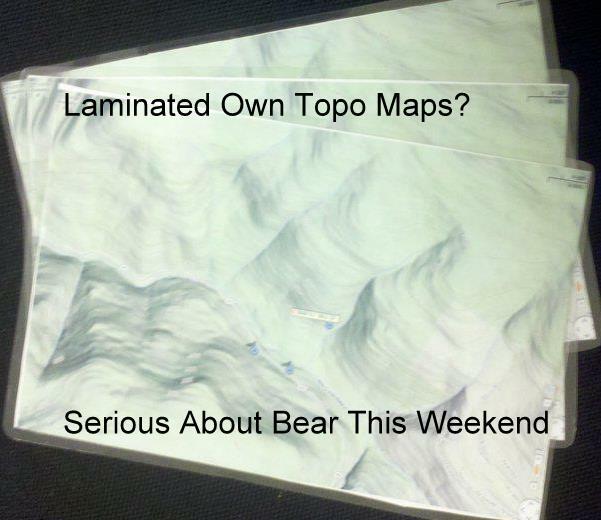 This time, I’m supplying GPRS radios and homemade topo maps. The backside of the maps (not shown) is a 3D Google Earth closeup showing the face of the mountain from the perspective of our approach. It would be ridiculous to say, “I think this weekend will be it,” for an activity whose outcome is as uncertain as hunting. If we are successful, however, it will only reinforce my desire to join the coterie of folks able to walk into the woods and walk out able to eat well for months. Good grief – better that tree than you!